If you choose to install and use the CLI locally, this tutorial requires that you are running the Azure CLI version 2.0.4 or later. Run az --version to find the version. If you need to install or upgrade, see Install Azure CLI. To create a resource group, use the az group create command. An Azure resource group is a logical container in which Azure resources are deployed and managed. In this example, a resource group named myResourceGroup in the eastus region. To create a virtual machine based on the Oracle Database image and configure it to use Oracle ASM, use the az vm create command. The following example creates a VM named myVM that is a Standard_DS2_v2 size with four attached data disks of 50 GB each. If they do not already exist in the default key location, it also creates SSH keys. To use a specific set of keys, use the --ssh-key-value option. After you create the VM, Azure CLI displays information similar to the following example. Note the value for publicIpAddress. You use this address to access the VM. To create an SSH session with the VM and configure additional settings, use the following command. Replace the IP address with the publicIpAddress value for your VM. 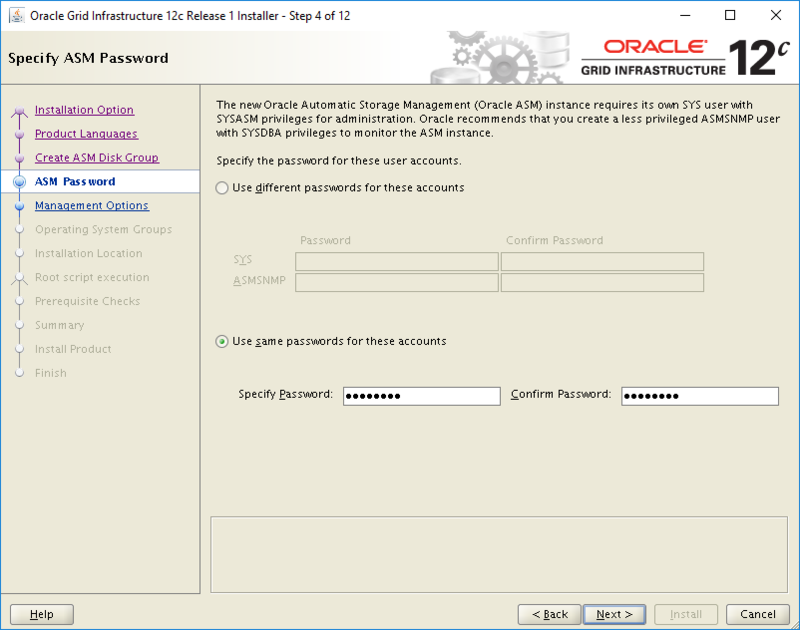 To install Oracle ASM, complete the following steps. For more information about installing Oracle ASM, see Oracle ASMLib Downloads for Oracle Linux 6. The output of this command should look similar to the following, stopping with prompts to be answered. Building a new DOS disklabel with disk identifier 0xf865c6ca. Repeat the preceding fdisk command for /dev/sdd, /dev/sde, and /dev/sdf. Change the passwords for the root, oracle, and grid users. Make note of these new passwords as you are using them later during the installation. 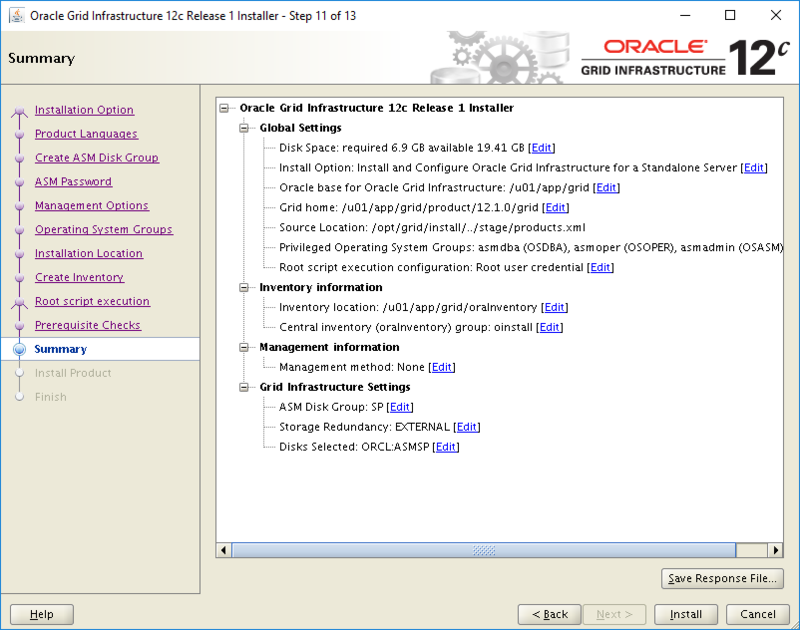 Download Oracle Grid Infrastructure from the Oracle ASM download page. Under the download titled Oracle Database 12c Release 1 Grid Infrastructure (12.1.0.2.0) for Linux x86-64, download the two .zip files. Update configured swap space. Oracle Grid components need at least 6.8 GB of swap space to install Grid. The default swap file size for Oracle Linux images in Azure is only 2048MB. You need to increase ResourceDisk.SwapSizeMB in the /etc/waagent.conf file and restart the WALinuxAgent service in order for the updated settings to take effect. Because it is a read-only file, you need to change file permissions to enable write access. Search for ResourceDisk.SwapSizeMB and change the value to 8192. You will need to press insert to enter insert mode, type in the value of 8192 and then press esc to return to command mode. To write the changes and quit the file, type :wq and press enter. We highly recommend that you always use WALinuxAgent to configure swap space so that it's always created on the local ephemeral disk (temporary disk) for best performance. For more information on, see How to add a swap file in Linux Azure virtual machines. 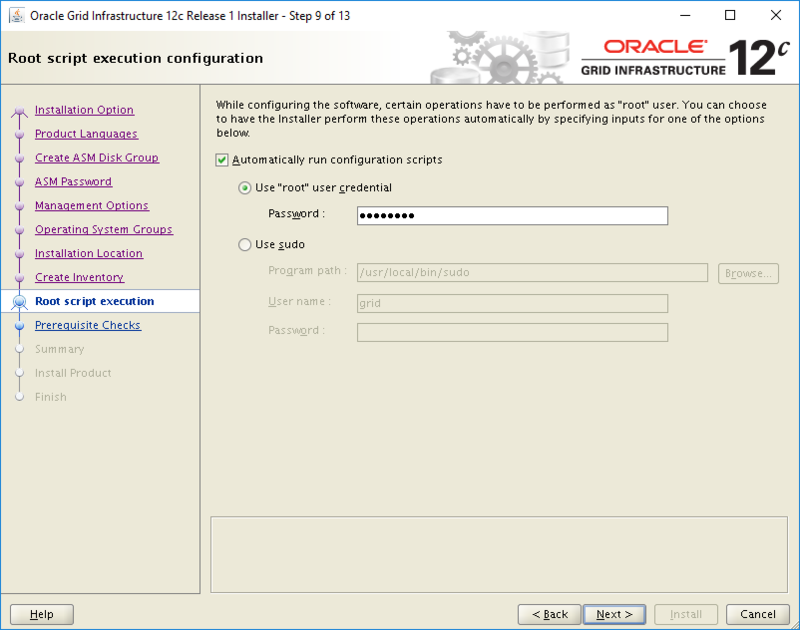 Configuring Oracle ASM requires a graphical interface to complete the install and configuration. We are using the x11 protocol to facilitate this installation. If you are using a client system (Mac or Linux) that already has X11 capabilities enabled and configured - you can skip this configuration and setup exclusive to Windows machines. 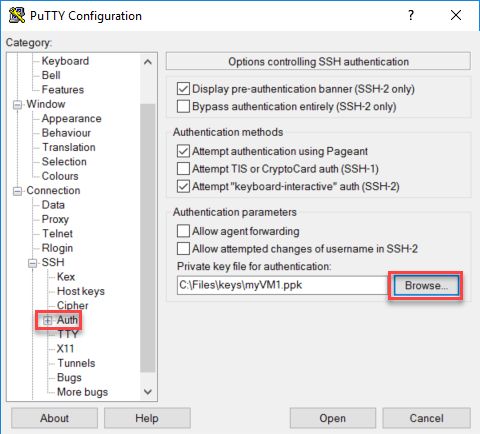 Download PuTTY and download Xming to your Windows computer. You will need to complete the installation of both of these applications with the default values before proceeding. After you install PuTTY, open a command prompt, change into the PuTTY folder (for example, C:\Program Files\PuTTY), and run puttygen.exe in order to generate a key. Generate a key by selecting the Generate button. Copy the contents of the key (Ctrl+C). Select the Save private key button. Ignore the warning about securing the key with a passphrase, and then select OK. Create a file named authorized_keys. Paste the contents of the key in this file, and then save the file. The key must contain the string ssh-rsa. Also, the contents of the key must be a single line of text. On your client system, start PuTTY. In the Category pane, go to Connection > SSH > Auth. In the Private key file for authentication box, browse to the key that you generated earlier. In the Category pane, go to Connection > SSH > X11. Select the Enable X11 forwarding check box. In the Category pane, go to Session. Enter your Oracle ASM VM <publicIPaddress> in the host name dialog box, fill in a new Saved Session name and then click on Save. Once saved, click on open to connect to your Oracle ASM virtual machine. The first time you connect you are warned the remote system is not cached in your registry. Click on yes to add it and continue. If you are running Windows, make sure you have started Xming before you begin the installation. 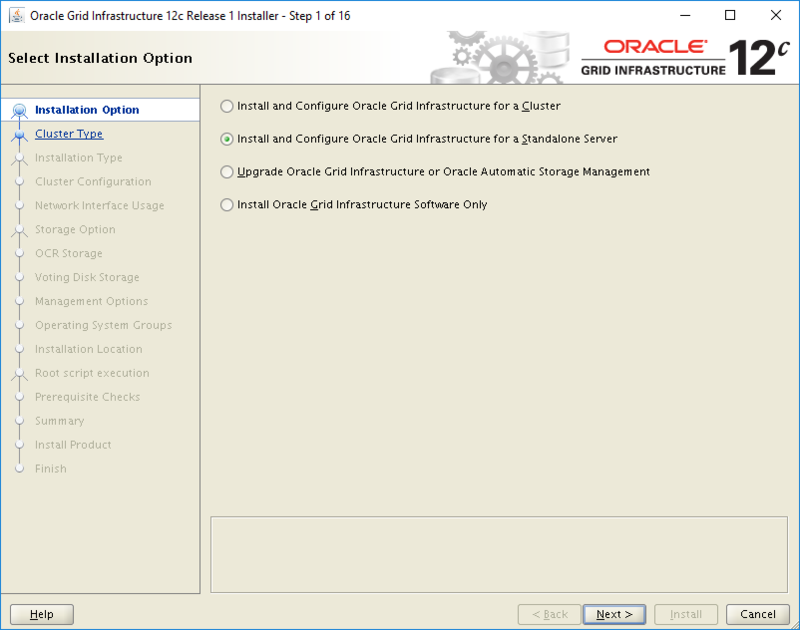 On the Select Installation Option page, select Install and Configure Oracle Grid Infrastructure for a Standalone Server. On the Select Product Languages page, ensure English or the language that you want is selected. Click next. Enter a name for the disk group. Under Allocation Unit Size, select 4. Under Add Disks, select ORCLASMSP. On the Specify ASM Password page, select the Use same passwords for these accounts option, and enter a password. On the Specify Management Options page, you have the option to configure EM Cloud Control. We are skipping this option - click next to continue. On the Privileged Operating System Groups page, use the default settings. Click next to continue. On the Specify Installation Location page, use the default settings. Click next to continue. On the Create Inventory page, change the Inventory Directory to /u01/app/grid/oraInventory. Click next to continue. On the Root script execution configuration page, select the Automatically run configuration scripts check box. Then, select the Use "root" user credential option, and enter the root user password. On the Perform Prerequisite Checks page, the current setup will fail with errors. This is an expected behavior. Select Fix & Check Again. In the Fixup Script dialog box, click OK.
On the Summary page, review your selected settings, and then click Install. A warning dialog box appears informing you configuration scripts need to be run as a privileged user. Click Yes to continue. On the Finish page, click Close to finish the installation. 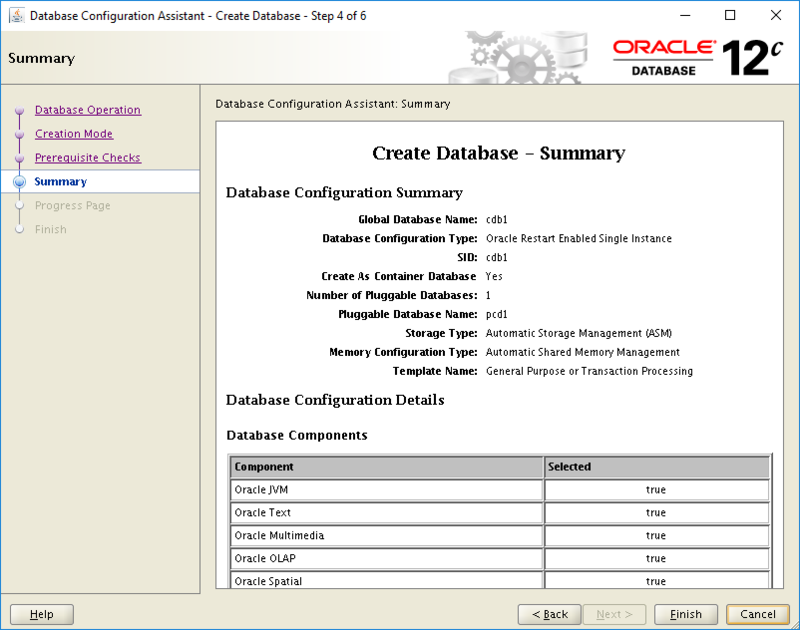 Oracle ASM Configuration Assistant opens. 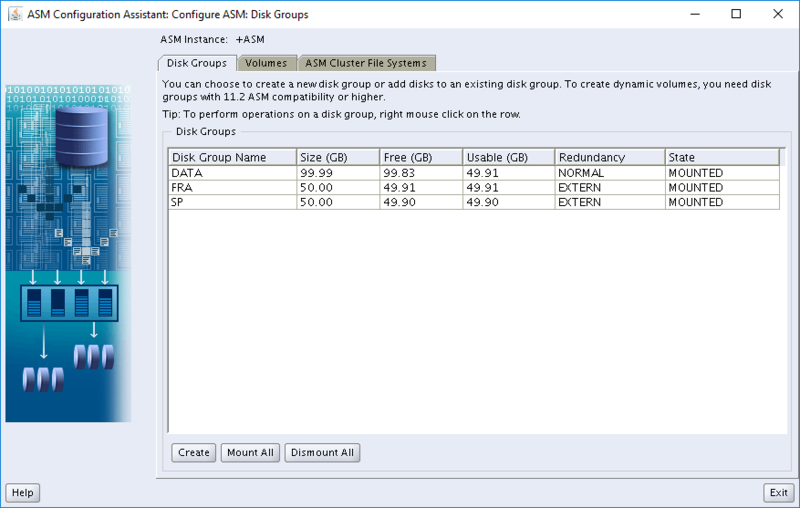 In the Configure ASM: Disk Groups dialog box, click the Create button, and then click Show Advanced Options. Enter the disk group name DATA. 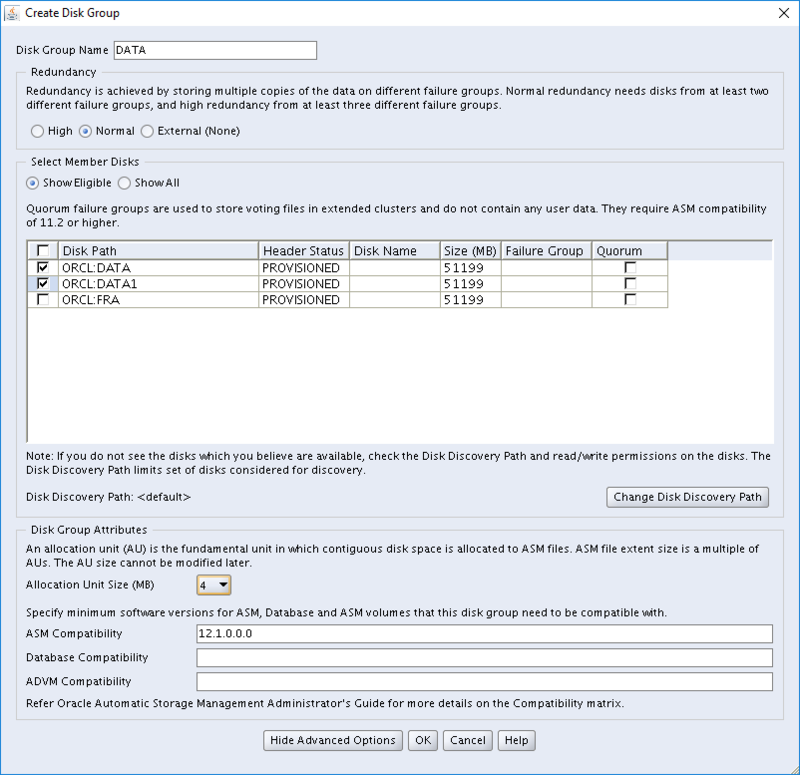 Under Select Member Disks, select ORCL_DATA and ORCL_DATA1. 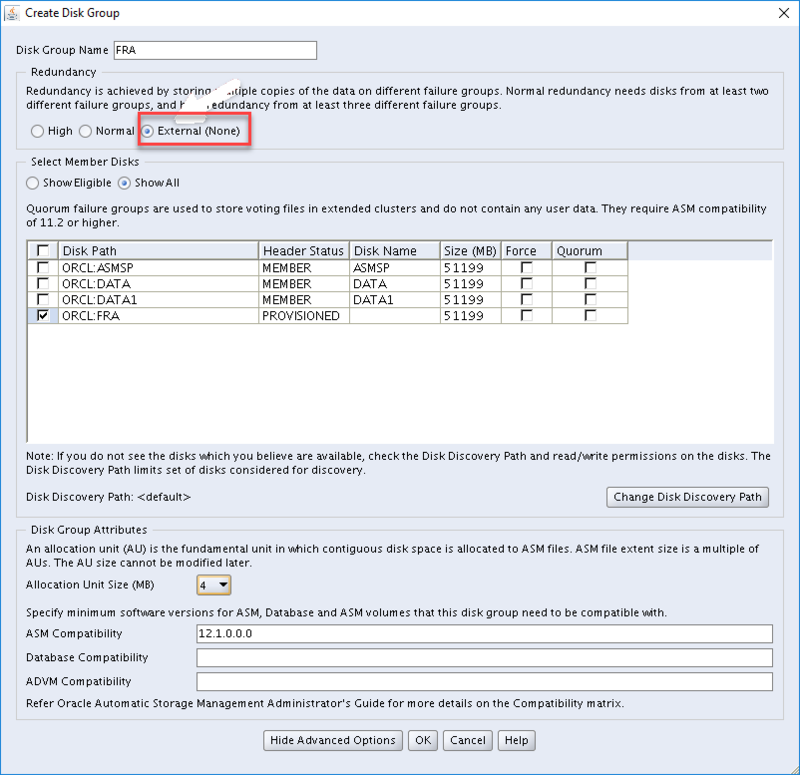 Click ok to create the disk group. Enter the disk group name FRA. Under Redundancy, select External (none). 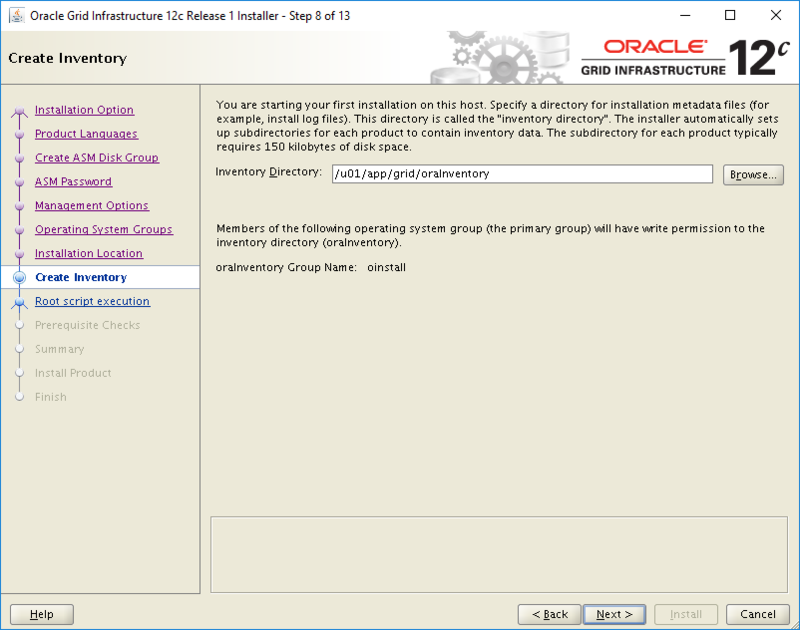 Under Select Member Disks, select ORCL_FRA. Select Exit to close ASM Configuration Assistant. On the Database Operation page, click Create Database. For Storage Type, ensure Automatic Storage Management (ASM) is selected. For Database Files Location, use the default ASM suggested location. For Fast Recovery Area, use the default ASM suggested location. type in an Administrative Password and confirm password. ensure create as container database is selected. type in a pluggable database name value. On the Summary page, review your selected settings, and then click Finish to create the database. The Database has been created. On the Finish page, you have the option to unlock additional accounts to use this database and change the passwords. If you wish to do so, select Password Management - otherwise click on close.